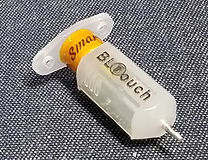 I would like to use a bltouch sensor in my Mendel90 kit printer. There are two screws + nuts needed. To be able to adjust the height I think a few washers between the mounting plate and the x-carriage should be enough. So far so good. As you can see, there is no room for the nuts, so I trapped them under the motor. Do you think that would work at all? Then the Melzi needs a new firmware. Is Neil's version able to handle such a sensor? Is anybody else interested in the files I changed? I tend to use heatfit threaded brass inserts instead of trapped nuts these days. I would try to move it nearer the hot end so it probes as close as possible. You can replace one of the wingnuts with one of these: [hydraraptor.blogspot.co.uk] to make room. I would probably just press fit an insert to make those nowadays rather than a captive nut. I haven't investigated Marlin's bed levelling or kept up with its development. Edited 1 time(s). Last edit at 07/05/2017 07:38AM by nophead.